Leaders of SPIE, the international society for optics and photonics, joined with other partners in a centenary celebration earlier this month of the 100 years of Institut d’Optique. The institute has played a major role in advancing photonics and stimulating innovation and entrepreneurship based on applications of the technologies. Paul Montgomery, left, and Hans Tiziani, right, at the centenary celebration of l'Institut d'Optique. The influence of l'Institut d'Optique is felt around the world. 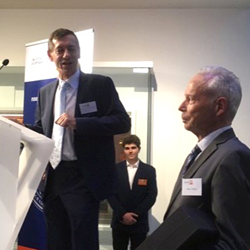 One hundred years of achievement in light-based technologies were honored by leaders of SPIE, the international society for optics and photonics, and others in the photonics community during centenary celebrations last week at the Institut d’Optique in Paris. “From your state-of-the-art laboratory, to your top-ranked school of engineering, to your partnerships with industry, the Institut d'Optique is truly a world-class alliance,” said Paul Montgomery (Université de Strasbourg), speaking on behalf of SPIE during ceremonies on 13 October. Montgomery and SPIE Fellow Hans Tiziani (Universität Stuttgart ) — a graduate of the institute — presented a commemorative plaque to institute Director General Jean-Louis Martin on behalf of the society. Montgomery is a General Chair of SPIE Photonics Europe 2018, to be held in Strasbourg next April. Established in 1917, the Institut d'Optique has grown from a one-year course followed by a few students in the first years, to the promotion of 150 student-engineers on three sites today, in Bordeaux (Le laboratoire Photonique Numérique and Nanosciences), Paris-Saclay (Le laboratoire Charles Fabry), and Saint Etienne (Le laboratoire Hubert Curien/ERIS). Its mission, established by law in 1920, is to support the French photonics industry through training of scientific engineers, doctoral training, innovation-entrepreneurship, and research at the highest level.